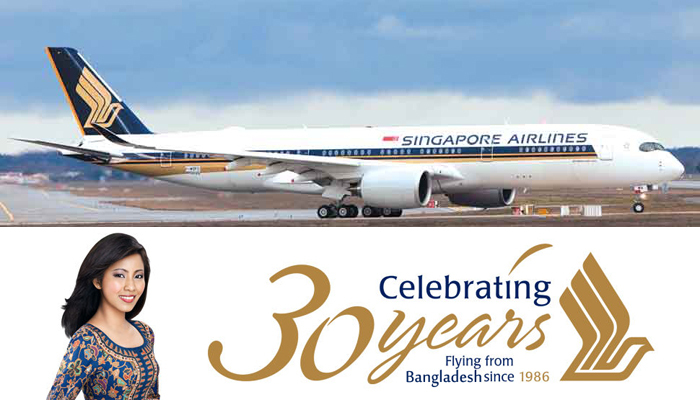 Singapore Airlines has launched a special Facebook campaign-- “Share Your #SQ30Memories” to celebrate its 30th year of operations in Bangladesh. The international Airlines Company is inviting all Facebook fans to submit content related to Singapore Airlines Bangladesh between 1986 and 2016. Fans of Singapore Airlines are invited to share their memories in various formats, such as essays,stories, photographs, videos, sketches, or any other format. From 1 August to 25 September, weekly winners will be announced on the Singapore Airlines Facebook page based on relevance and merit of the post and will be awarded with gift hampers. In addition,at the end of the campaign, three of the weekly winners will be selected and ranked first, second and third respectively .The first prize winner will receive two Singapore Airlines Economy Class return tickets to Singapore. The second prize winner will receive one Economy Class return ticket to Singapore. The third prize winner will receive a Singapore Airlines gift hamper. The contest runs from 1 August to 25 September 2016. For details on this #SQ30Memories campaign and terms and conditions of the contest,please visit https://www.facebook.com/singaporeair/posts/10154405800143679.